Colocasia leaves, colocasia esculenta, arbi, arvi, taro and elephant ears are just a few names of this tropical edible plant. The leaves and tubers are used in various parts of the world. I have grown up eating the wonderful leaves steamed. 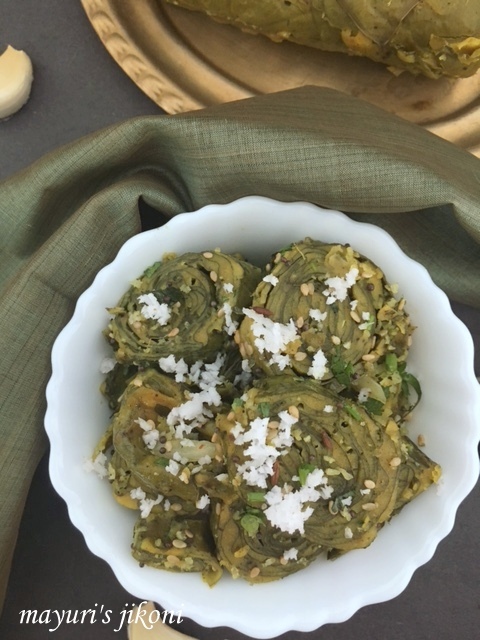 Yes believe it or not but these leaves taste wonderful once cooked in the typical gujarati style. We know it as paan bhajia, but it goes by the name arbi or arvi in India. My all time favourite, these plants grow easily so we had loads of them growing in our garden. Had to have many leaves, considering the size of the family. However, now I have to buy them as I cannot grow them in my small apartment. The tuber is made into a dry vegetable or curry , stuffed paratha or even fried in some parts of India. The leaves are readily available in the market in Mombasa and Mumbai but have not seen them in Bangalore. The leaves are available in most Indian vegetable shops in the UK. The leaves are smeared with a paste, rolled up, steamed, cut and then stir fried or eaten hot with oil and lemon juice. Mix all the ingredients for the paste very well and keep on the side till required. Wash the leaves. Trim any brown parts. Turn the leaf over. Slice off the thick middle vein and the 2 side ones as close as possible. Do the same with the rest of the leaves. Place a leaf with the tapering part towards you and the shiny side down. Smear it with the paste. Place another leaf on top but this time the tapering part away from you and remember the shiny part down. Smear paste over the leaf. Fold one third part of the leaf towards the middle. Repeat with the other side. Now roll up the leaves tightly starting from the tapering part towards you. You should get a neat swiss roll type log. Repeat with the remaining leaves. If you have taken 14 leaves then you should have 7 rolls. Put some water in a deep pan(quarter full). Place a greased steaming plate or tray into it. Make sure its not touching the water. Or use a dokhra steamer. Once the water starts boiling, place the rolls carefully onto the plate. Cover the pan and let the rolls steam for 30 minutes. Remove the plate after 30 minutes from the pan. Let the rolls become cold. If you try and cut them when they are hot, they become squishy. Cut each roll into about ½ inch slices. Heat the oil for tempering in a wide pan over low heat. When it is hot, add fenugreek seeds and then the mustard and sesame seeds. Add the chopped garlic. Stir fry till it becomes light pink. Add the paan slices and mix gently. Garnish with coconut and coriander and serve hot with slices of lemon. If you do not want to temper them, then serve the steamed paan drizzled with oil and lemon juice. If the leaves are too small, then place four of them to get a diamond shape and then roll them up. If the leaves are too big, then just roll up one. The measurement for the paste is for 14 medium sized leaves. If you have some paste left over, store it in the freezer till you make paan next time. Use a steel colander that just fits into your pan or use the collapsible steaming tray available in the market if you do not have steaming trays. I love This dish so much but never made it at home from the scratch. I get the frozen stuffed leaves here and I make it.